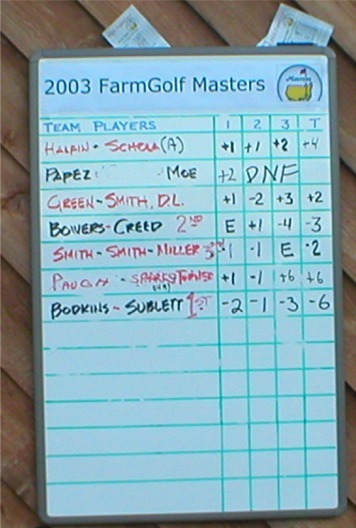 (FGP) Cool, clear weather prevailed for the 2nd annual FarmGolf Masters. Fifteen of the top 30 FarmGolfers in the World gathered for play. In addition, two rookies made their debut at this tournament. Two injured golfers, Lynn Phillips and Scott Springer, attended and acted as roving course monitors. The rookies making their debut were Joe Smith from Richmond, VA and Jedd Schola from Philippi, WV. Two and three man teams were paired, including the mandatory, as required by the bylaws of FarmGolf, Commissioner and Club Pro team. The Commissioner and Club Pro disappointed their legion of fans, performing quite dismally and finishing fourth at +2. Much more was expected from these two, who last year at the US FarmGolf Open set a course record of -9 for 18 holes. 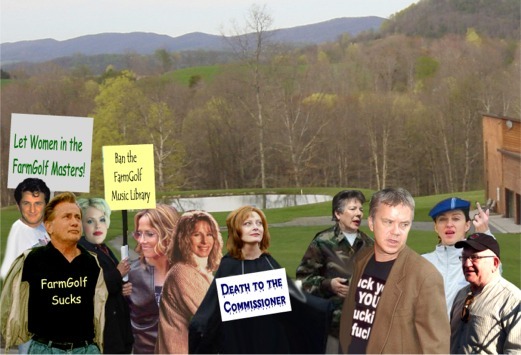 (FGP) As the Iraqi War came to a quick end, and the Saturday protest at Augusta National drew only some 40 protestors, Martha Burk called upon some of her Hollywood friends to protest what she called “the next best thing to raise a bunch of hell about”. 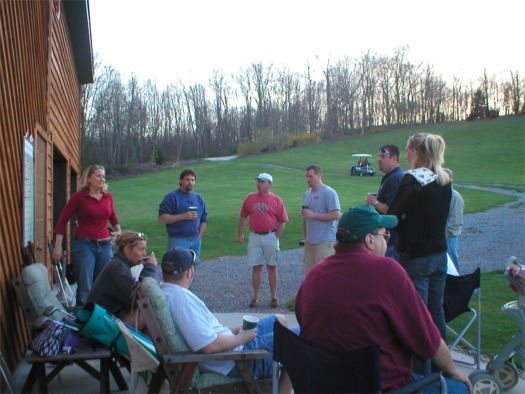 Operating without a permit, the group arrived about one hour before the tournament started. Although smaller in number than the previous day’s protest in Georgia, the group made up for it by hurling obscenities to each golfer as they arrived at the FarmGolf entrance. After a couple of hours the group became agitated as passerbys on Route 92 threw empty beer bottles at them. Fearing injury to “President Sheen”, the group returned to their electric cars parked at the intersection of Route 92 and Stalnaker Road and drove away. It would appear that a “protest break” may be in store for most of the group as things are not going very well in all of their disruptive endeavors. (FGP) The 2003 course upgrading started with the construction of a sand trap on No. 1 hole. A total of three sand traps are to be constructed, one on either side of Hole No. 1 and a third in front of Hole No. 2. Also, an in-stream pond is planned to the far right of Hole No. 3, as well as another small pond in the swampy area below and to the right of No. 2 hole. Additional rocks in out-of-bounds areas are being removed and all of the work will be completed by the end of May. (FGP) The next tournament will be the US FarmGolf Open on June 15th. Details will be discussed in the May Newsletter, which will detail course improvements and other upcoming events. (FGP) All active FarmGolfers and their immediate golfing family are invited to participate in the educational aspects of world music by becoming a FarmGolf Music Library patron. To better enhance one’s after-golfing recreational abilities, it is necessary to maintain and listen to a large amount of music on-site at the Clubhouse. At press time, there are a total of 57.8 Gigabytes of music in the library, with a large donation not yet catalogued.